This article is about the ancient Greeks and the Roman Empire. For the modern form of wrestling, see Greco-Roman wrestling. For the Greek-speaking Eastern Roman Empire, see Byzantine Empire. The Temple of Olympian Zeus in Athens, construction started by Athenian tyrants in 6th century BC and completed by Roman emperor Hadrian in 2nd century AD. 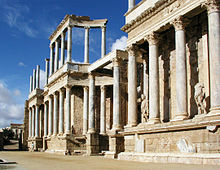 Roman Theatre of Mérida, Spain. The Greco-Roman world, Greco-Roman culture, or the term Greco-Roman (/ˌɡrikoʊˈroʊmən/ or /ˌɡrɛkoʊˈroʊmən/); spelled Graeco-Roman in the United Kingdom and the Commonwealth), when used as an adjective, as understood by modern scholars and writers, refers to those geographical regions and countries that culturally (and so historically) were directly, long-term, and intimately influenced by the language, culture, government and religion of the ancient Greeks and Romans. It is also better known as the Classical Civilisation. In exact terms the area refers to the "Mediterranean world", the extensive tracts of land centered on the Mediterranean and Black Sea basins, the "swimming-pool and spa" of the Greeks and Romans, i.e. one wherein the cultural perceptions, ideas and sensitivities of these peoples were dominant. This process was aided by the universal adoption of Greek as the language of intellectual culture and commerce in the Eastern Mediterranean Sea, and of Latin as the tongue for public management and forensic advocacy, especially in the Western Mediterranean. Though Greek and Latin never became the native idioms of the rural peasants who composed the great majority of the empire's population, they were the languages of the urbanites and cosmopolitan elites, and the lingua franca, even if only as corrupt or multifarious dialects to those who lived within the large territories and populations outside the Macedonian settlements and the Roman colonies. All Roman citizens of note and accomplishment regardless of their ethnic extractions, spoke and wrote in Greek and/or Latin, such as the Roman jurist and Imperial chancellor Ulpian who was of Phoenician origin, the mathematician and geographer Claudius Ptolemy who was of Greco-Egyptian origin and the famous post-Constantinian thinkers John Chrysostom and Augustine who were of Syrian and Berber origins, respectively, and the historian Josephus Flavius who was of Jewish origin and spoke and wrote in Greek. A map of the ancient world, centred on Greece. Based on the above definition, it can be confidently asserted that the "cores" of the Greco-Roman world were Italy, Greece, Cyprus, the Iberian Peninsula, Asia Minor (roughly corresponds to modern Turkey), Gaul (modern France), Greater Syria, Egypt and Africa north of the Sahara. Occupying the periphery of this world were "Roman Germany" (the Alpine countries and the so-called Agri Decumates, the territory between the Main, the Rhine and the Danube), Illyria, Macedonia, Thrace (roughly corresponds to modern Bulgaria), Moesia (roughly corresponds to modern northern Bulgaria), and Pannonia (the former Yugoslavia, and Albania, and Hungary). Also included was Dacia (roughly corresponds to modern Romania), Nubia (roughly corresponds to modern northern Sudan), Mauretania (modern Morocco and western Algeria), Arabia Petraea (the Hejaz and Jordan, with modern Egypt's Sinai Peninsula), the Tauric Chersonesus (modern Crimea and the coast of Ukraine). The Greco-Roman world had another "world" or empire to its east, the Persians. with which there was constant interaction (Xenophon, The Anabasis, or, the March Up Country, the Greco-Persian wars, the famous battles of Marathon and Salamis, the Greek tragedy "The Persians" by Aeschylus, Alexander the Great's defeat of the Persian emperor Darius III and conquest of the Persian empire, or, the later Roman generals' difficulties with the Persian armies, such as Pompey the Great, and of Marcus Licinius Crassus (conqueror of the slave general Spartacus), who was defeated in the field by a Persian force, and was beheaded by them. (Ref: Appian, The Civil Wars). In the schools of art, philosophy and rhetoric, the foundations of education were transmitted throughout the lands of Greek and Roman rule. Within its educated class spanning all of the "Greco-Roman" eras, the testimony of literary borrowings and influences is overwhelming proof of a mantle of mutual knowledge. For example, several hundred papyrus volumes found in a Roman villa at Herculaneum are in Greek. From the lives of Cicero and Julius Caesar, it is known that Romans frequented the schools in Greece. The installation, both in Greek and Latin, of Augustus's monumental eulogy, the Res Gestae, is a proof of official recognition for the dual vehicles of the common culture. The familiarity of figures from Roman legend and history in the "Parallel Lives" composed by Plutarch is one example of the extent to which "universal history" was then synonymous with the accomplishments of famous Latins and Hellenes. Most educated Romans were likely bilingual in Greek and Latin. "Greco-Roman" architecture is the architecture of the Roman world that followed the principles and style established in ancient Greece. The most representative building of that era was the temple. Other prominent structures that represented the style included government buildings, like the Roman Senate, and cultural structures, like the Colosseum. The three primary styles of column design used in temples in classical Greece were Doric, Ionic and Corinthian. Some examples of Doric architecture are the Parthenon and the Temple of Hephaestus in Athens, while the Erechtheum, which is located right next to the Parthenon is Ionic. The Romans made it possible for individuals from subject peoples to acquire Roman citizenship and would sometimes confer citizenship on whole communities; thus, "Roman" became less and less an ethnic and more and more a political designation. By AD 211, with Caracalla's edict known as the Constitutio Antoniniana, all free inhabitants of the Empire became citizens. 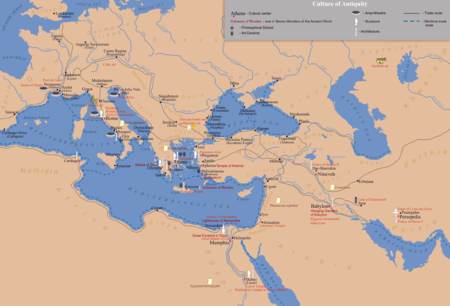 As a result, even after the Fall of Rome, the people of the empire that remained (later referred to by many historians as the Byzantine Empire) continued to call themselves Romans even though Greek became the main language of the Empire. Rhomaioi is what they continued to call themselves (Hellenes referring to pagan Greeks) through the Ottoman era and even into modern times. Wikimedia Commons has media related to Greco-Roman world. Sir William Smith (ed). Dictionary of Greek and Roman Geography. London: Spottiswoode and Co, 1873. Simon Hornblower and Antony Spawforth (ed). Oxford Classical Dictionary. Oxford University Press, 2003.